Building applications in today’s world involves a lot of work assembling, managing and monitoring all of those various components that need to come together across myriad environments. To help with this chore, HashiCorp is rolling out an application development hub called Atlas, its first commercial product based on its various open-source technology. The startup is also announcing a $10 million series A funding round from Mayfield Fund, GGV Capital and True Ventures (see disclosure). HashiCorp’s biggest claim to fame is its open-source Vagrant tool that helps developers quickly spin up virtual environments so they can build and test their software projects before they see the light of day. Over time, the startup developed other open-source tech to help coders with all aspects of the software-development process; from Serf, which handles cluster management and makes sure those developer environments don’t fail, to Consul, which helps users discover and configure all the services running in their coupled-together applications. With Atlas, the startup is bundling up all of its open-source software into one package and throwing in a dashboard that will supposedly let coders see how their application is performing in both public and private clouds or hybrid environments. 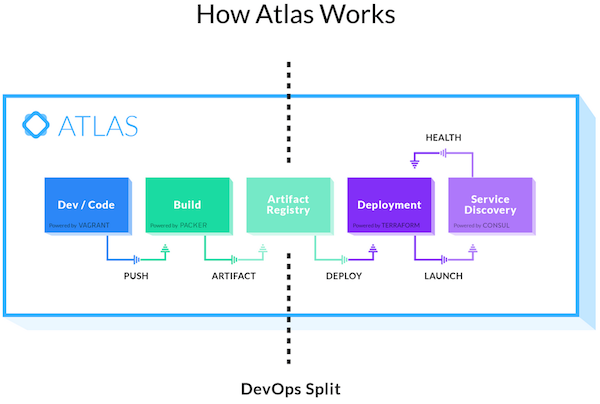 The Atlas software-as-a-service is now available in beta and will be available to the public in the first quarter of 2015; the company will explain pricing by then and will unveil an on-premise version. Disclosure: HashiCorp is backed by True Ventures, a venture capital firm that is an investor in the parent company of Gigaom.